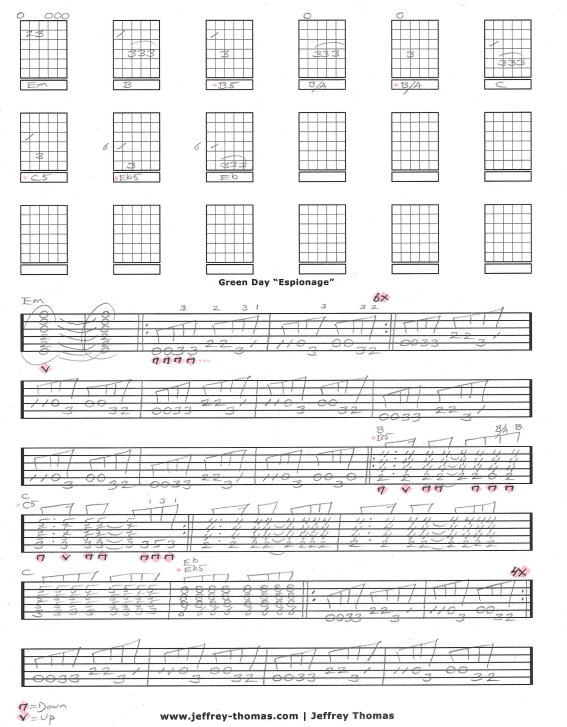 Green Day Espionage Free Guitar Tab by Jeffrey Thomas. Learn to play this retro surf-spy styled instrumental by Green Day with my custom guitar tab. Follow the song structure, chords and licks just like the recording. Want the full guitar tab for free? Just enter your email address in the form provided and I will send it off to you. If you like Green Day’s punk style of guitar playing let me know. Make sure to fill out the Schedule A Free Lesson form and we can set up your free Skype guitar lesson today! “Espionage” was featured on the soundtrack to Austin Powers: The Spy Who Shagged Me. Find more unique online guitar tab arrangements on my tab, video and blog pages.